The Archive hasn’t a clue who these men were, or where they were – at a guess it might have something to do with the distinguished-looking gentleman with the cane in the middle of the group. Can anybody help us out? 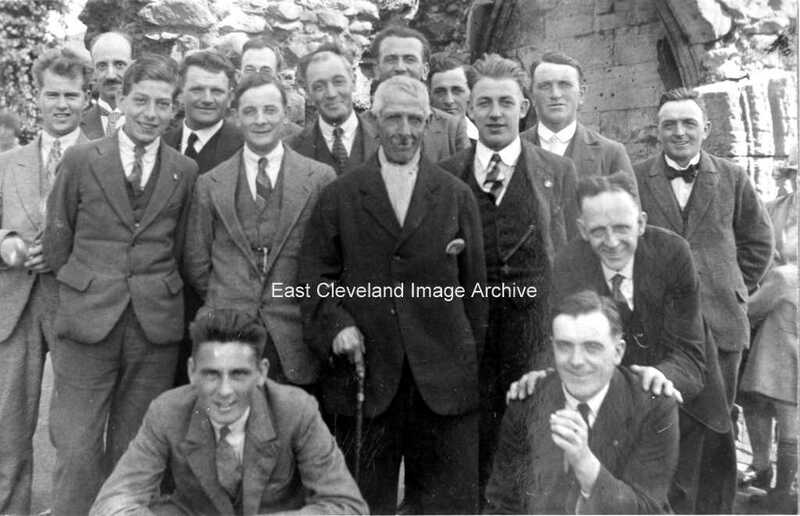 Wayne Raspison tells us: “The gentleman in the middle is Thomas Vincent Raspison my great grandfather. I was led to believe the picture was taken on a church outing but I don’t know where. I think it would have been around the late 1920’s as he died in 1930. Originally from Gravesend in Kent he came to the area in the early 1870’s to find work originally in a printers shop and then as an ironstone miner. He lived in High Row for most of that time and married a local girl Elizabeth Thomas. I have this obituary from a newspaper cutting. Many thanks to Wayne Raspison for that update. 1 comment to Men’s Day Out? The gentleman in the middle is Thomas Vincent Raspison my great grandfather. I was led to believe the picture was taken on a church outing but I don’t know where. I think it would have been around the late 1920’s as he died in 1930. Originally from Gravesend in Kent he came to the area in the early 1870’s to find work originally in a printers shop and then as an ironstone miner. He lived in High Row for most of that time and married a local girl Elizabeth Thomas. I have this obituary from a newspaper cutting. Obituary Death of Mr. Thomas Vincent Raspison. On Wednesday, last week, the death took place of one of the most familiar and best known personalities of Loftus, in the person of Mr. Thomas Vincent Raspison. The deceased was a widower, his wife having pre-deceased him about 16 years ago, and had attained the ripe age of seventy-nine years. For some time he had been in failing health, and his death followed upon a seizure. On his retirement as an ironstone miner Mr. Raspison assisted Mr. W. J. Robinson, auctioneer, and had a very jocular manner in carrying out his duties, and his genial presence will be greatly missed. The deceased was a keen lover of sport, and was one of the pioneers of the Loftus Athletic Sports Club and a member of the Committee. For about forty years Mr. Raspison officiated as the town bellman, and for thirty-five years he was organ blower at St. Leonard’s Parish Church, and recently, as a mark of appreciation of his faithful services, the choir and members of the congregation presented him with a handsome testimonial, which he highly appreciated. The funeral took place on Saturday afternoon at the Loftus Cemetery, there being a large and representative gathering. The first portion of the burial service took place at St. Leonard’s Parish Church, which was conducted by the Rev. C. Ramsden (Rector) and Captain Halls (Church Mission). Two of the deceased’s favourite hymns were impressively sung “Lead, kindly light,” and “O God, our help in ages past,” and on the procession leaving the church the “Dead March” (in Saul) was played by Mr. C. Trevillion, the organist. The coffin bore several beautiful wreaths and floral tokens of esteem, including one from each of his four sons.